Your wing skin stickers will be printed using professional grade equipment and materials to ensure a top quality product. Stickers will come laminated and contour cut as standard. Select your choice of colours and the demo graphic will change accordingly to help you decide what colour combination you like. Enter up to 5 sponsor / manufacturer logos that you require in to the 'sponsor / manufacturer logo' box provided. We have an extensive list of manufacturer logos but in the event we do not currently have the logo you have selected, we shall contact you to confirm the correct logo and will then create the logo required, free of course! If you wish, you may also upload an image of the required logo using the 'graphic upload' button. Some manufacturers have several versions of their logos so if you are unsure then please contact us at info@rcidentity.com and we will be happy to clarify things for you. You may also opt to have your name on the wing side plates if you wish. Colours and layouts are graphical representations only and may vary slightly to the actual product received. 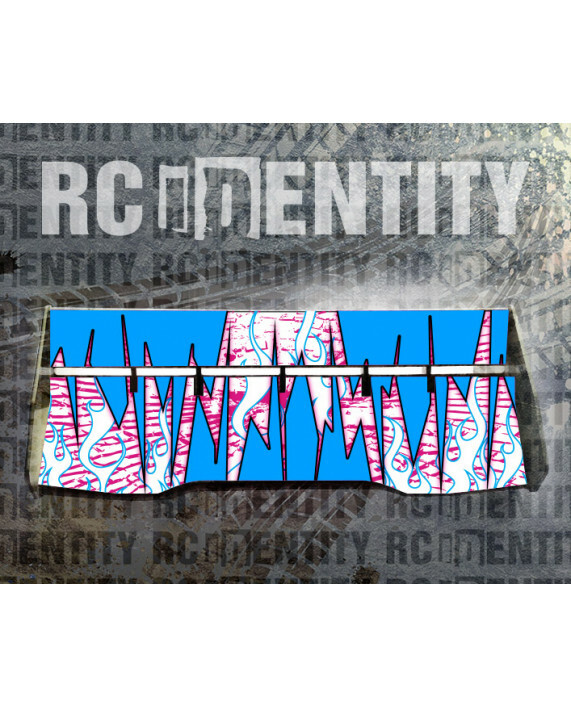 All custom printed items will come with some form of RC Identity branding on them. Style, placement and colour will vary depending on the item and this is at the discretion of RC Identity.